Adding a custom built BBQ to your outdoor kitchen will take your next backyard get-together to the next level. MasterAZscapes LLC has some of the most skilled technicians to install custom built-prefabricated BBQ Islands and outdoor kitchens that Phoenix residents trust. We offer a free design consultation to be sure we are meeting all your needs. Providing comprehensive designs for your outdoor kitchens, Phoenix homeowners love begins with a single visit. We’ll meet with you to discuss what you’re looking for in an outdoor kitchen and how we can accomplish it. A consultation allows us to work collaboratively on your vision, acquiring necessary information for a smart, aesthetically pleasing design. As landscape experts, we know how to correctly incorporate natural terrain and features into our outdoor kitchens. This creates scenic kitchens that are great for relaxing, socializing, and enjoying the outdoors. Add in a mini-fridge, gorgeous countertops, built-in benches, and lots of shade and you have a place that will draw your family outside. You will become the go-to place for extended family and friends to gather. 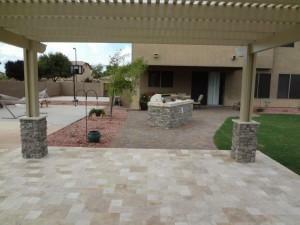 Adding outdoor kitchens Phoenix properties benefit from is like adding an additional room to your home. You get get a great new area now, and a sizable addition to the value of your home if you decide to sell in the future. 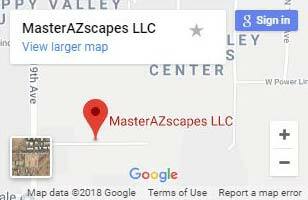 MasterAZscapes offers some of the most innovative and unique ideas for outdoor kitchens in Phoenix and the surrounding areas. We do everything possible to make the design phase a pleasant and positive experience. We start by thoroughly inspecting the space. We also sit down with you and give you our full attention as you describe what you want to do with your outdoor kitchen. Everything we design will be based around your plans and how you envision using your outdoor kitchen space. So if you’re ready to throw out that old grill on a cart and convert you grilling area into an integral part of your backyard, give us a call. Accents such as stack stone or tile can really enhance and highlight your backyard design. Stucco on your island can be painted to match your home so it doesn’t clash with the your home’s design. Tile can be integrated into your island to match your pool and or interior kitchen. Electrical outlets are a very handy addition; any basic outdoor kitchen in Phoenix will require a minimum of two double outlets. We are happy to integrate things such as shade structures, masonry, outdoor lighting, and more to optimize the look and appeal of your outdoor kitchen. BBQ Islands can be built in many different styles. For the best fit to your yard’s design you should consider functionality and fashion. Islands can be built on raised decks, in sunken bars, or on the decking’s surface. Stone Veneer wrapping or staggered finish also adds attraction to your island as well. When you contact us about your outdoor kitchen possibilities we take as much time as you need to go over your options in detail. Finding the right style and functionality for your plans matters to us. For professionally designed and installed outdoor kitchens, Phoenix relies on us. Call (623) 780-0474 or Contact Us today for a free consultation!